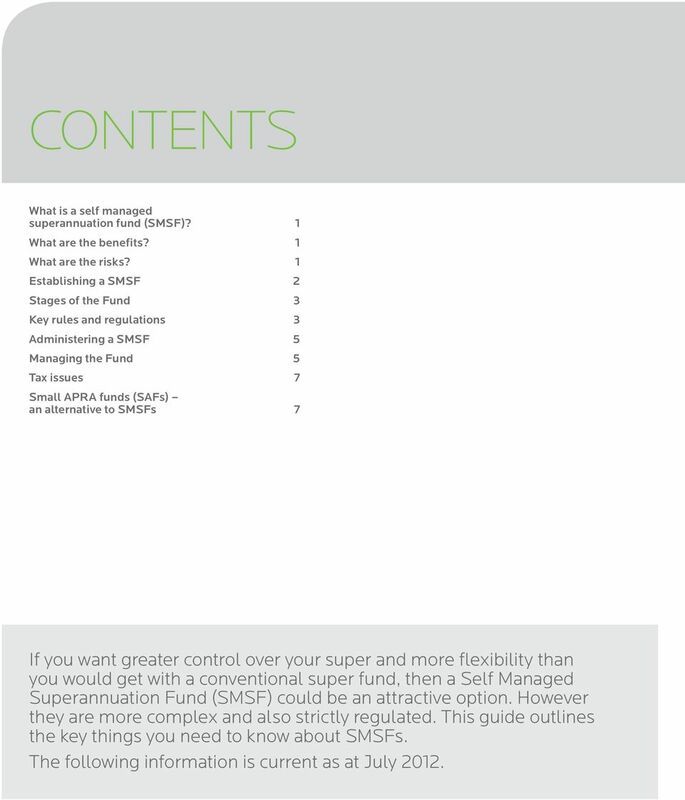 Download "A Financial Planning Technical Guide"
2 Contents What is a self managed superannuation fund (SMSF)? 1 What are the benefits? 1 What are the risks? 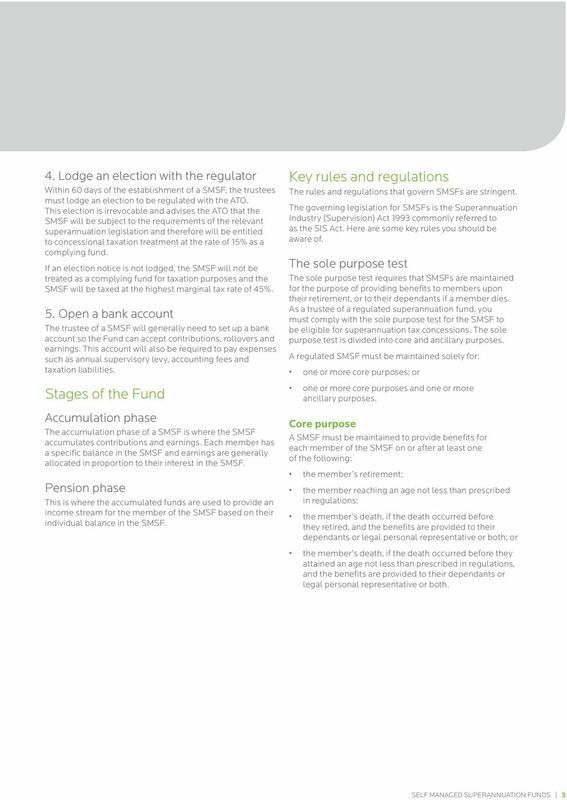 1 Establishing a SMSF 2 Stages of the Fund 3 Key rules and regulations 3 Administering a SMSF 5 Managing the Fund 5 Tax issues 7 Small APRA funds (SAFs) an alternative to SMSFs 7 If you want greater control over your super and more flexibility than you would get with a conventional super fund, then a Self Managed Superannuation Fund (SMSF) could be an attractive option. However they are more complex and also strictly regulated. 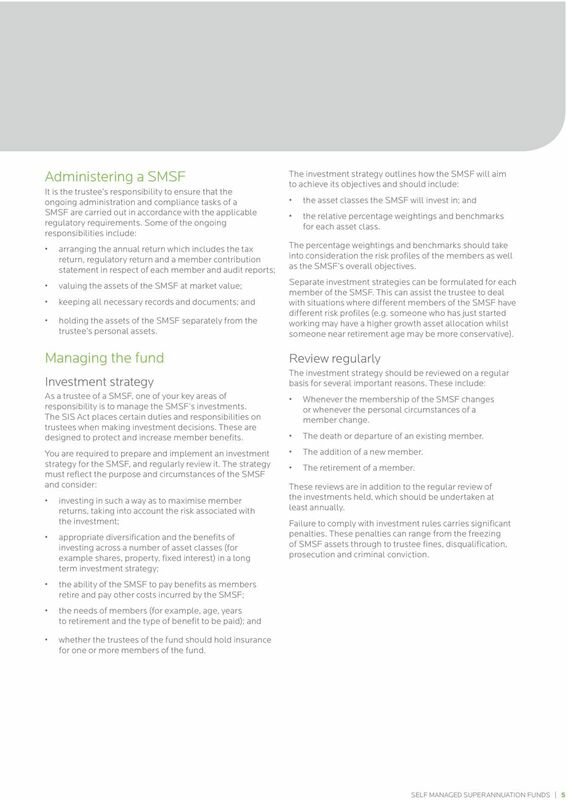 This guide outlines the key things you need to know about SMSFs. The following information is current as at July 2012. 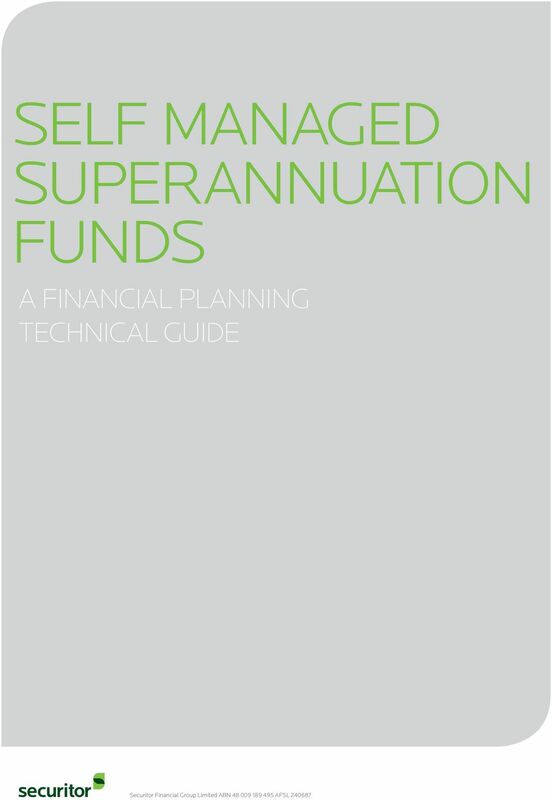 Self managed superannuation funds A Financial Planning Technical Guide 2 Self managed superannuation funds What is a self managed 4 superannuation fund (SMSF)? What are the benefits? 4 What are the risks? Taking control of your superannuation. Good SMSF Advice helps business owners achieve their goals. 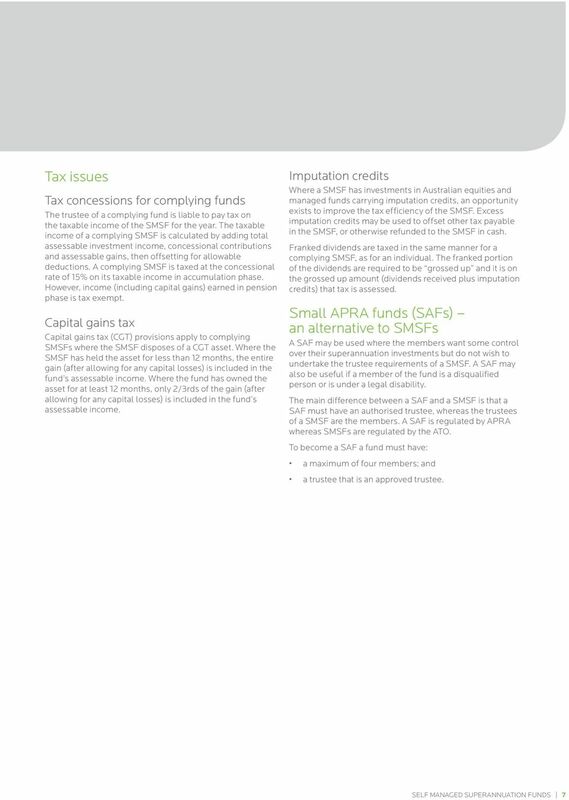 SMSF Solutions for Advisers & Accountants. CLIENT FACT SHEET. If you are under age 65 you may make personal contributions to superannuation on your own behalf. Individuals face a number of considerations in deciding to establish a Self Managed Superannuation Fund (SMSF). This article considers some of those considerations and outlines some of the steps involved. Is your. potential? Right Strategy. n Print clearly, using a BLACK pen only. n Print X in ALL applicable boxes. personal superannuation solutions. 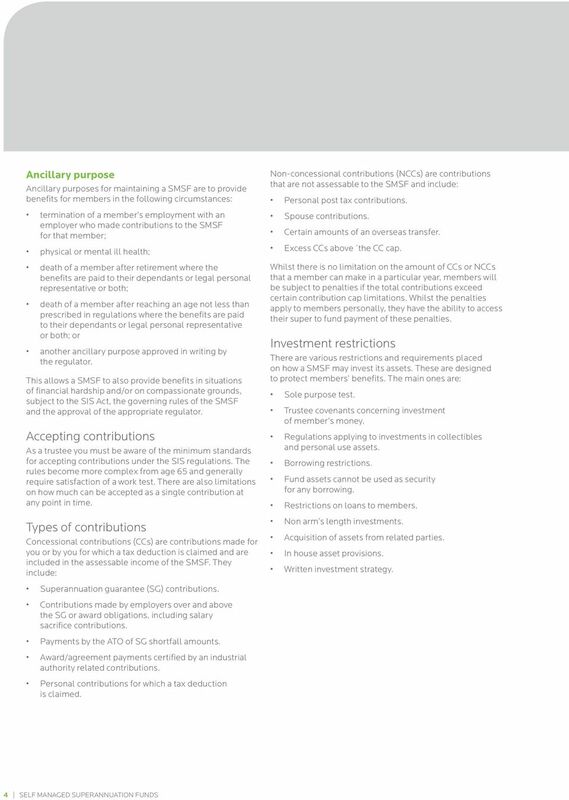 Disclosure Document for Self-Managed Superannuation Fund Services Updated 14 April 2011. IOOF Technical Advice Solutions Client strategies for advisers. 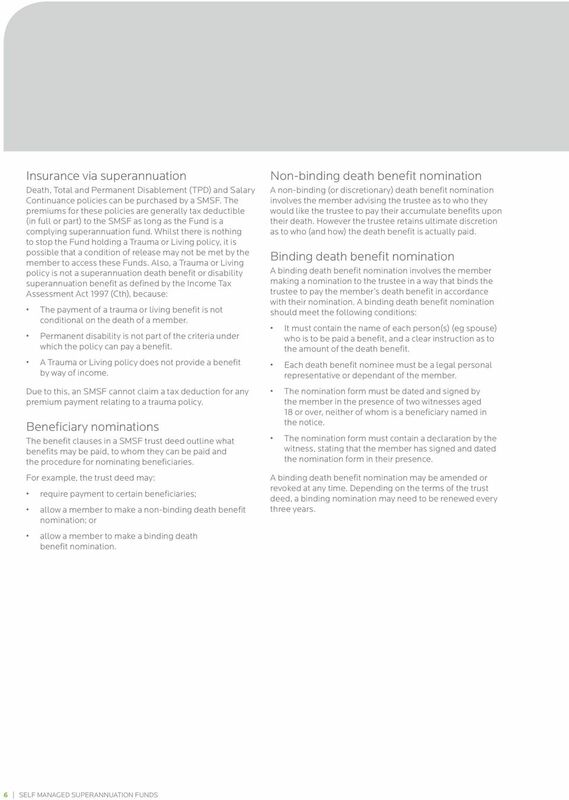 Superannuation and death benefits in the Simpler Super environment. Q & A - SMSFs. 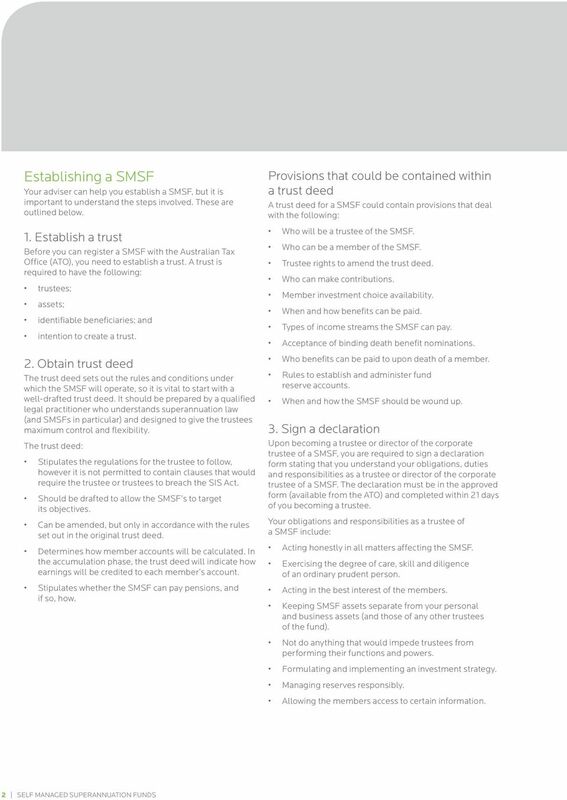 Our trust deed allows for the trustees of the SMSF to be either a corporate trustee or individuals. Getting Assets into your SMSF Agenda What is a contribution? When is a contribution made? In-Specie transfer of assets Contribution caps Contribution strategies How can we help? What is a Contribution? 1 What is the role of a financial planner when advising a client about retirement planning? Are you ready to become part of Australia s largest superannuation pool? Tailored SMSF and managed account solutions. When are you eligible to claim this tax exemption? How much ECPI can you claim? Make sure your SMSF is. 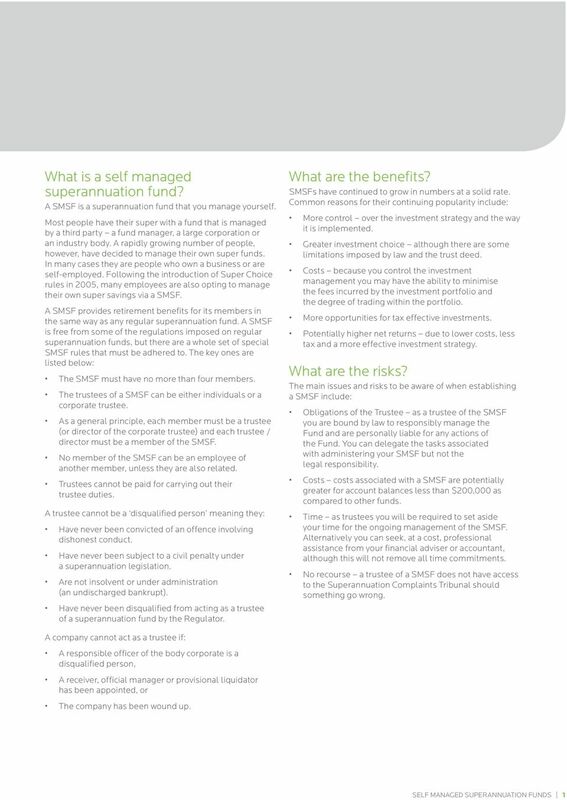 SMSF insurance Important information: This document has been prepared by CommInsure, a registered business name of The Colonial Mutual Life Assurance Society Limited ABN 12 004 021 809 AFSL 235035 (CMLA). Issued ₁ July ₂₀₁₅. Member guide. SuperLeader Fact sheet. 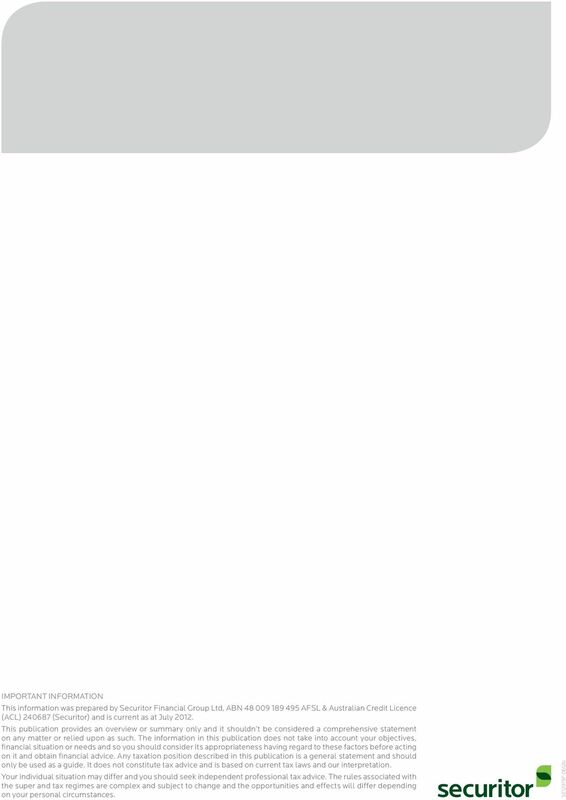 AMP Corporate Super Registered trademark of AMP Life Limited ABN 84 079 300 379.